The PlayStation 4 was released to acclaim, with critics praising Sony for acknowledging its consumers' needs, embracing independent game development, and for not imposing the restrictive digital rights management schemes similarly to those announced by Microsoft for Xbox One. Critics and third-party studios also praised the capabilities of the PlayStation 4 in comparison to its competitors; developers described the performance difference between the console and Xbox One as "significant" and "obvious". Heightened demand also helped Sony top global console sales. By the end of December 2018, over 94 million PlayStation 4 consoles had been shipped worldwide, surpassing lifetime sales of its predecessor, the PlayStation 3. 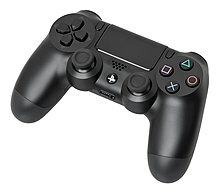 As of December 2018, 91.6 million PlayStation 4 consoles had been sold through to customers worldwide. ^ Mishkin, Sarah (November 13, 2013). "Foxconn profits beat expectations". Financial Times. (Registration required (help)). ^ "Introducing the 500 Million Limited Edition PS4 Pro, Commemorating 500 Million Systems Sold". PlayStation.com. 2018 Sony Interactive Entertainment LLC. Retrieved 10 August 2018. ^ "The PS4 has finally overtaken the PS3 in Sony's latest financial report". Destructoid. 2018-07-31. Retrieved 2018-07-31. ^ Leadbetter, Richard (November 30, 2015). "Sony unlocks more CPU power for PS4 game developers". Eurogamer. Archived from the original on January 4, 2016. Retrieved 23 August 2018. ^ "Media Player Coming to PS4 Tonight – PlayStation.Blog". 2015-06-16. Retrieved 2018-11-10. ^ Colin Moriarty (28 February 2013). "Ustream on Consoles Not Exclusive to PS4". IGN. Retrieved 10 July 2015. ^ "Media Create Sales: Week 30, 2018 (Jul 23 - Jul 29)". ResetEra. Retrieved 2018-08-02. ^ "Media Create Sales: Week 13, 2019 (Mar 25 - Mar 31)". ResetEra. Retrieved 2019-04-03. ^ "SONY INTERACTIVE ENTERTAINMENT INTRODUCES "PLAYSTATION®4 PRO 500 MILLION LIMITED EDITION"" (Press release). Tokyo: Sony Interactive Entertainment. August 9, 2018. Retrieved 2018-08-10. ^ a b Thang, Jimmy (2018-02-23). "PS4 Vs PS4 Pro Vs PS4 Slim: What Are The Differences And Which PlayStation Console Should You Buy?". GameSpot. Retrieved 2019-01-08. ^ Welch, Chris (2017-02-03). "Sony confirms new PS4 Pro "Boost Mode" will help some older games run faster and smoother". The Verge. Retrieved 2019-01-08. ^ Leadbetter, Richard (2018-11-07). "PlayStation 4 Pro CUH-7200 review: the latest, quietest hardware revision". Eurogamer. Retrieved 2019-01-07. ^ "PS4 Pro Gets Minor Hardware Update, Changing Model to CUH-7100". DualShockers. 2017-10-03. Retrieved 2018-11-10. ^ Inc, Aetas. "PS4 Pro Jet Black model number changed to "CUH - 7100 BB 01". "With internal parts change, there is no difference in specifications" (translated by Google Translate from Japanese)". www.4gamer.net (in Japanese). Retrieved 2018-12-10.